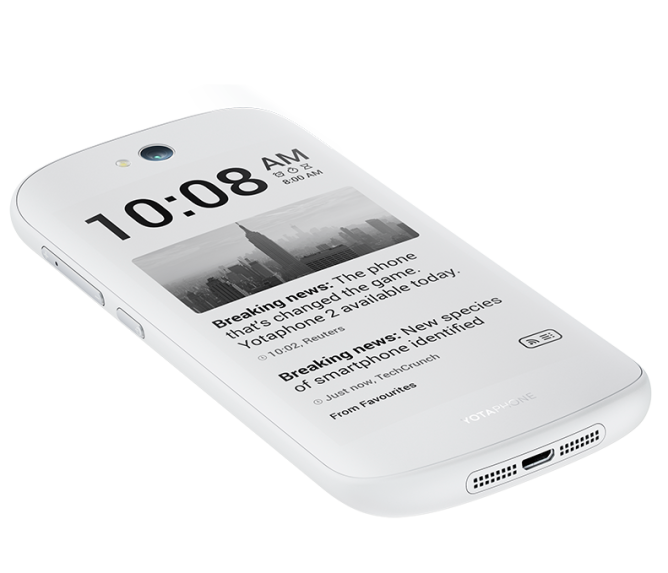 The YotaPhone 2 and its predecessor have always intrigued me. They're probably the only significant departure in form factor available on the market right now that isn't different for the sake of being so, adds value, and has been relatively successful in its endeavor. 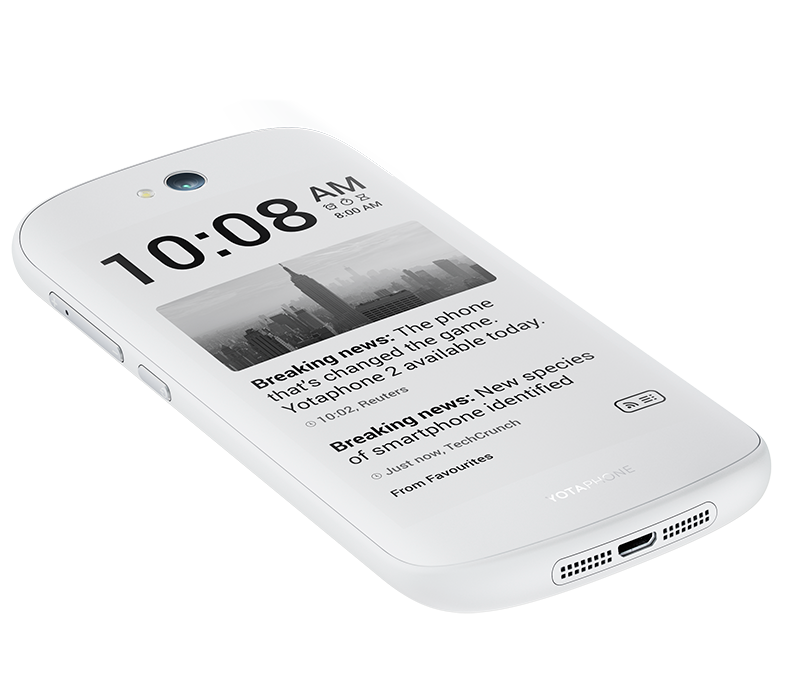 After its European release last December, the YotaPhone 2 is coming back with a new color variant: white. And it looks striking if you ask me, especially with that new E Ink white theme where the old interface's colors are inverted. But let's back up. 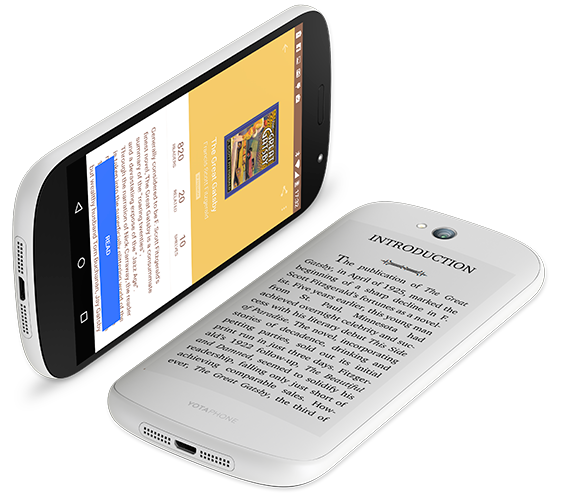 The white YotaPhone 2 keeps the same specs as the black one: a primary 5-inch Full HD AMOLED screen, a 4.7-inch 960x540 E Ink screen on the back, a Snapdragon 801 processor, 2GB of RAM, 32GB of storage, and an 8MP rear camera. The differences are purely visual and mostly affect the sides and back of the device. Yota decided to keep the black front plastic panel, which it says is in accordance with the main AMOLED screen, but the sides of the phone are white with brushed metal for the volume rocker and power button (instead of plastic on the black variant). The back plastic surrounding the E Ink display has also gone white, and there is an option to use a black-on-white theme instead of the usual white-on-black one. 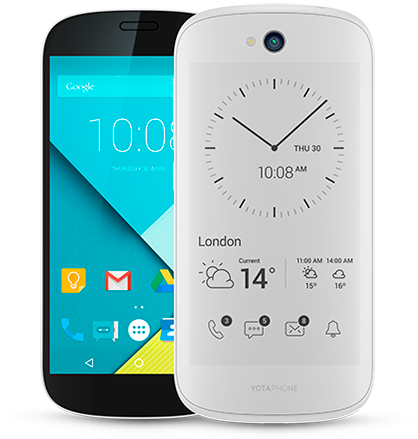 An update to Lollipop 5.0 is rolling out to all YotaPhone 2 devices and aside from all the improvements to Android that this new version packs, it also adds some significant changes to Yota's own software layer mostly affecting the E Ink side. It should be easier to set up a YotaCover (think of it like a widget-based lockscreen) and to switch between panels on the back display. New covers have joined the ranks of previously available options, including Twitter, Facebook, Instagram, YotaRemote (a Wi-Fi Smart TV remote), YotaSports, YotaNotes (which syncs with Google Drive), and Yotagram (a special Telegram version). To further entice users, the YotaPhone 2 is getting a price drop. Where the phone usually cost £555 in the UK and €699 in the rest of Europe, it is now discounted to £440 and €599 respectively. Yota is also launching a Wireless Power Bank with a Qi charging plate and a 4000 mAh battery for £35 in the UK and €49 in Europe. For the Yota fans who live in the US, there's hope of good news. According to Engadget, the company is looking into an Indiegogo campaign to help it reach American customers. It might not be the wide launch we were hoping for, but at least it should give users the possibility of purchasing a YotaPhone 2 and having it delivered in the US without a lot of fuss.